LS1 - that's a truly amazing picture - difficult to imagine that four huge faces are fed from this - well, I think there are four faces - fancy me passing the TH thousands of times and I couldn't say for certain if there's a face on every side One VERY red face here !! Yes Blakey it is a great photo of the mechanism. As a kid I never even got to grips with Meccano sets so I look at such a mechanism with fascination as to how it and similar things were ever constructed! The clock on Fulneck Church Pudsey is also a Potts Clock i have seen the workings and it was a surprise to see how basic they looked. 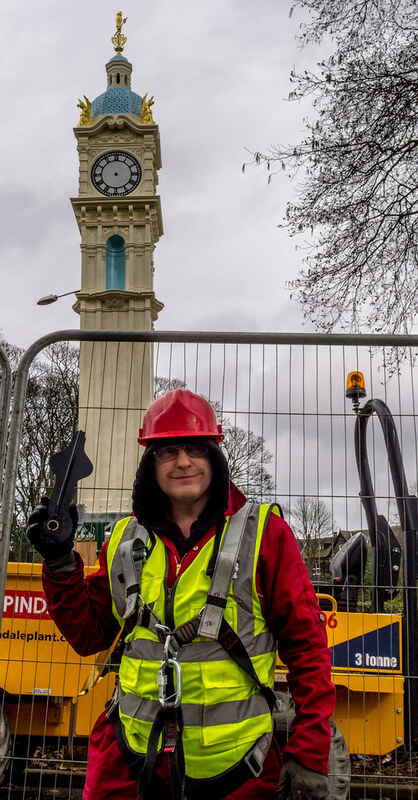 A little more on Pott's Oakwood clock - even has my old boss looking happy! The OAKWOOD CLOCK restoration continues. It was a surprise to me when I recently found out that the clocks on Leeds Minster are Potts Clocks. These are 2 photos that I took on July 7 2015. The first is a zoomed-in view of the clock above the Kirkgate frontage of Leeds Minster and the second is a view of that frontage. The clock tower has 4 clocks but though none of them seemed to have the Potts name I assume that they are all Potts Clocks. Zoomed-in view of the Potts Clock on the Kirkgate frontage of Leeds Minster (taken July 7 2015). Leeds Minster from Kirkgate (taken July 7 2015). The 3 Potts Clocks at the old Midland Bank at the junction of North Street and Meanwood Road were 'stopped' at 6:00 for a long while now (at least 1 but possibly more years). Passing by a couple of weeks back now (and reminded when I passed by in early pm today, Oct 14 2015), I noticed they all now read 6:05!